According to the Medical University of South Carolina’s Nutrition Services, water makes up 60% of male bodies and 50% of females. The human body requires water to rid itself of toxins, increase blood volume, and regulate temperature. It hydrates, cleanses and keeps the body in balance. Immersing in water lowers heart rate. It’s no surprise that water workouts have enormous aerobic and anaerobic benefits as well. Water is 700 times denser than air which encourages excellent resistance training. With weight training a muscle group contracts and releases, pulling against gravity, then lowering or resisting gravity, known as concentric and eccentric motions. Because of water’s dense properties, a muscle’s first (concentric) movement and second (eccentric) movement have equal resistance. Using equipment such as buoyancy belts, flotation cuffs, resistance tubing, and water dumbbells and barbells increase resistance. Water workouts enhance and promote muscle strength and tone. Combining water workouts with a weight training routine is a phenomenal way to reshape and increase muscle definition. The cooling properties of water allow the body to perform strongly for longer periods of time that result in fresh blood flow and nutrients to all parts of the body. This increased circulation provides oxygen to the muscles and requires less effort from the heart. Virtually all muscles in the body are engaged during swimming or during a 30 minute water workout. Water workouts can be done daily without the risk of overtraining, thus increasing one’s endurance. Although land-based cardio exercise such as running or fast walking improve heart function, they predominately work the lower body and require more oxygen to maintain the same pace as a vigorous water workout. These higher impact exercises require rest between workouts and are more likely to result in over training or strain to the bones and joints. Because of water’s buoyancy, injury is nearly non-existent. Water massages muscles, bones, and joints while it strengthens those same components of the body. A 130 pound woman weighs 13 pounds in neck-deep water, so much less stress is put on the body. Water workouts provide an excellent means of exercise for those afflicted with arthritis or osteoporosis; pregnant women; obese individuals, and athletes suffering from sports-related injuries. Because of buoyancy, joints are supported and have greater range of motion that enhances flexibility. With flexible joints, susceptibility to injury is decreased. Water workouts have enormous benefits by themselves or coupled with land-based exercises. 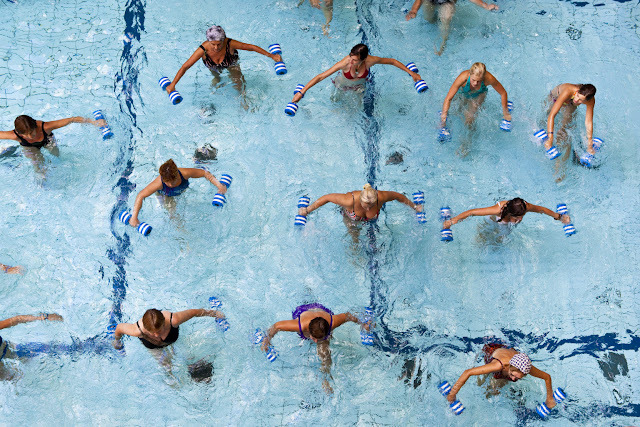 Depending upon the intensity of the workout, water aerobics or swimming can be equal to land-based exercises, in terms of overall physiological benefits. With proper technique and a regular training program, water workouts can strengthen muscles, improve flexibility, and increase cardio health. Does Men's Body Size Matter?